Since I'm a total Virgo --- where my ways of perfectionism and constant list-making make me incapable of flexibility --- one of the most difficult lessons for me to learn aside from patience, is that life is never on-schedule. April, on a personal level, threw some unexpected wrenches my way, and for most of us, it also ended on a pretty sour note, so it's why I don't fault Muhsinah for getting off-schedule with her monthly EP postings cause surprises often, and do come from all sides. 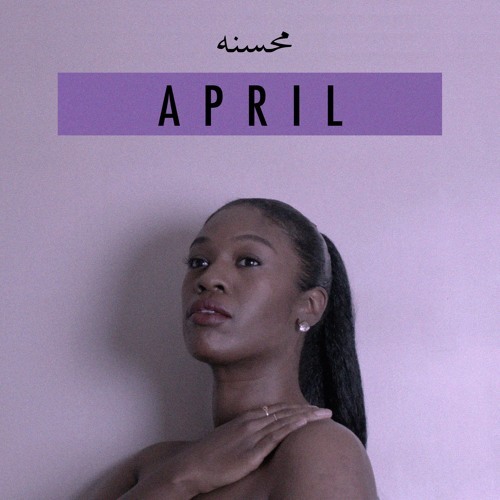 With April things are better late than never, as once again, Mushinah culls together a short, but savory collective that is drenched in chilled-out synths and sensual moods. Thanking the man upstairs for gifting her with a righteous bae, "Thankful" coasts on bubbly beats and a fetching chorus line, making it the easy highlight from this set. The mood of April then swings from lust to longing as the interlude "Habibi" briefly narrates the tale of a long distance love affair amid a hi-NRG backdrop. Guitar wails pierce the slow burning groove of "Lover", its aesthetic feeling right in step as a homage to Prince, with Muhsinah's vocals weaving in various pitches and tones as she attempts to woo back her parted lover. As always there is more to look forward too from Mushinah's monthly musings, and we'll get double the rewards as May is just getting started with another EP waiting to be queued. Can't wait!